The online casino market has never been busier or more competitive than it is at the moment, which is great news for players, who are being offered better and better promotions and gaming options. However, if you are launching a new casino site, then the current climate can make it feel like a real challenge to find a way to set yourself apart from the pack, many of which are sites with big brand names behind them and years of experience. One of the online casinos that has arrived on the scene in 2016 is Green Dog Casino, which is owned and operated by Nektan. Nektan have a habit of releasing very similar sites with little different apart from design concept, but they are also known for excellent game selections. So with those two things in mind, how does Green Dog Casino match up to its competition? The layout of Green Dog Casino will be very familiar to those who have played at other Nektan online casino sites such as Chomp Casino. What you get here is a near identical layout with a different colour scheme, which is disappointing. The aforementioned colour scheme, as I am sure you had guessed, is predominantly green, and there is a picture of a dog, so that’s the name of the site covered. Past that there is very little to talk about, many games are available from the homepage, navigation is simple enough, but even if you haven’t seen one of its duplicates, there is still very little of any interest about the design of Green Dog Casino. The mobile market has grown a huge amount in the last couple of years, and many sites are now adapting to cater for mobile and tablet players. That being said, there is still undoubtedly more space in this market, and by focusing predominantly on mobile and tablet players, Green Dog Casino has aimed for a more accessible market, which is definitely sensible. If the mobile market is one way to make yourself competitive, offering a decent range of games from different software providers is another. With games from the likes of Net Entertainment, Aristocrat, NextGen, and Nektan on offer, you will definitely find variety here. 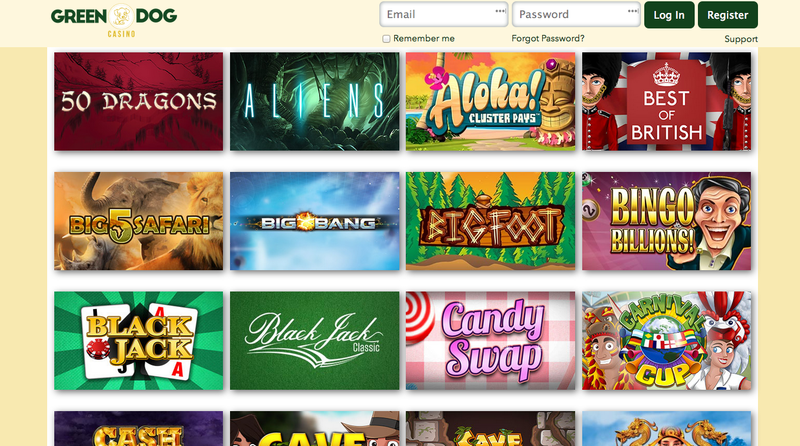 The main focus at Green Dog is on slots, and you will find all of your favourites here. Games like Starburst, Koi Princess, Gonzo’s Quest and Foxin’ Wins are amongst the popular titles you’ll find, as well as a fair few games you may not have seen before. Table and card game players have less option here, but they are certainly not left out. You’ll find roulette, blackjack, and poker in a few different variations to ensure that there will always be something of interest, this includes baccarat and video poker. If you’re looking for something of a change, or just a way to pass some time between slot games, then you are also able to play keno and bingo as well as a few other games that are less common in other places. By aiming at both the mobile and desktop market in equal measure (this involves a slightly stronger focus on mobile players who are still often overlooked by other casinos) and maintaining a real sense of fun, Green Dog Casino makes itself an excellent option. The predictable and uninspiring nature of the design theme is a downside; it is hard to get too excited when looking at this site. But the games on offer should be enough to bring some balance to the situation and ensure that you will enjoy your time at Green Dog Casino.